While the Gujarat government may claim to have decided to begin a “tobacco free Gujarat” campaign in 2011 when Prime Minister Narendra Modi was the state chief minister, yet, latest available data suggest that as many as 51.4 per cent of men and seven per cent of women in the state use any form of tobacco – it can be smoking cigarettes, bidis, cigars pipes, or hookas, chewing pan masalas with or without tobacco, use of gutkha or pan masala with tobacco, or use of khaini or snuff. What is worse, data show, while the percentage of those using tobacco has come down, Gujarat has faltered in the fight against tobacco vis-à-vis other states. However, compared to other states, the effort to free its population from tobacco addiction has clearly not been as effective. Indeed, the National Family Health Survey (NFHS) data for 2015-16, released a year ago, suggest that 51 per cent of men and seven per cent of women in the age group 15-49 “use some form of tobacco”, which is the seventh highest among 21 major Indian states. 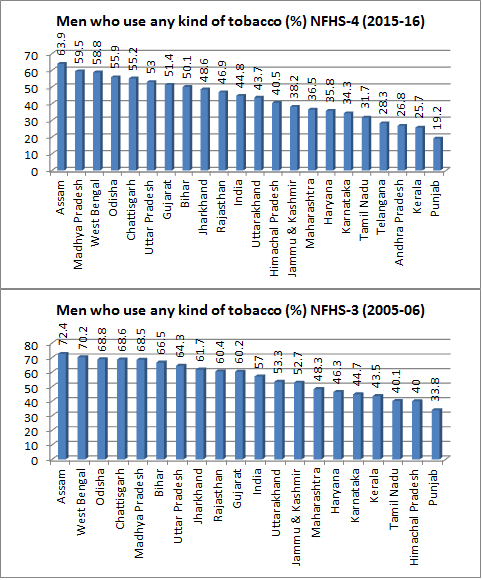 However, while a decade earlier, the percentage of men using tobacco was higher (60.2 per cent), NFHS data for 2005-06 show, Gujarat placed the nine highest among major Indian states. 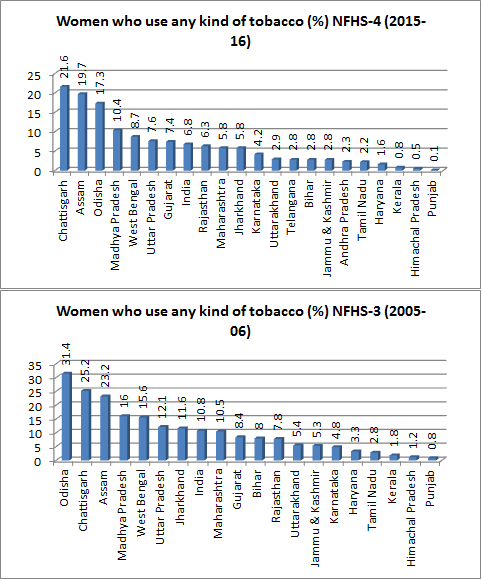 Similarly, if in 2005-06, Gujarat had the ninth highest percentage of women using tobacco, the state has “improved” its position to seventh a decade later, despite the fact that fewer percentage of females “use” tobacco now. If in 2005-06, 8.4 women were addicted to tobacco in some form, in 2015-16 it is down to 7.6 per cent. The six states where a higher proportion men are using tobacco than Gujarat (51.4 per cent), as of 2015-16, are: Assam 63.9 per cent, Madhya Pradesh 59.5 per cent, West Bengal 58.8 per cent, Odisha 55.9, Chhattisgarh 55.2, and Uttar Pradesh 53 per cent. A decade earlier, the nine states where a higher percentage of men used tobacco Gujarat (60.2 per cent) were: Assam 72.4 per cent, West Bengal 70.2 per cent, Odisha 68.8 per cent, Chhattisgarh 68.6 per cent, Madhya Pradesh 68.5 per cent, Bihar 66.5 per cent, Uttar Pradesh, 64.3 per cent, Jharkhand 61.7 per cent, and Rajasthan 60.4 per cent. Similarly, as for women, Gujarat’s 7.4 per cent of women are found to have used tobacco in 2015-16, as against a higher percentage of six other states: Chhattisgarh 21.6 per cent, Assam 19.7 per cent, Odisha 17.3 per cent, Madhya Pradesh 10.4 per cent, West Bengal 8.7 per cent, and Uttar Pradesh 7.6 per cent. In 2005-06, Gujarat’s 8.4 per cent women used tobacco, and the nine states with a higher percentage of women using tobacco were: Odisha 31.4 per cent, Chhattisgarh 25.2 per cent, Assam 23.2 per cent, Madhya Pradesh 16 per cent, West Bengal 15.6 per cent, Uttar Pradesh 12.1 per cent, Jharkhand 11.6 per cent, and Maharashtra 10.5 per cent. What is of equal significance is, the percentage of men and women using tobacco in Gujarat is much higher than the all-India average. 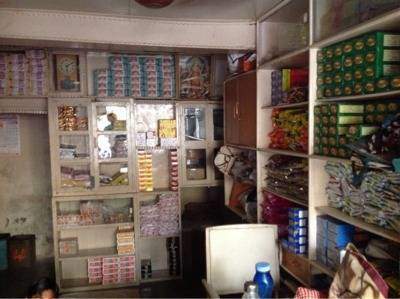 Thus, In 2015-16, the gap was about six per cent for men: In Gujarat, 51.4 per cent men used tobacco, as against the all-India average of 44.8 per cent. As for women, thought the gap is less than one per cent (Gujarat 7.4 per cent, as against India 6.8 per cent), what is of no less significant is, Gujarat women’s average was 8.4 per cent, lower than the national average (10.8 per cent). There is also a rural-urban difference in the use of tobacco. Thus, if in 2015-16, 5.2 per cent urban women use “any form of tobacco”, in rural areas it is 9.1 per cent. Things are not very different for men: 46 per cent men in urban areas as against 56.2 per cent in rural areas. The situation has failed to improve via-a-vis the country as a whole the state government decided to form five mobile flying squads with mobile vans, consisting of a police inspector and a health functionary, to take action against the use of tobacco in spots near places where the consumption of tobacco is prohibited, such as schools, educational institutions, public places, etc. While money might have been spent on campaigns to make Gujarat tobacco free, NGOs say, the campaign has been ineffective and confined itself to exhorting people on formal occasions for this and not proceed with the required commitment. Modi continues to be popular in spite of so many negative reports. Let us see what the election results tell us.